Now that spring is here, more and more children will be taking the opportunity to get outside in the lighter evenings and warmer weekends to enjoy some riding on their balance bikes. Maybe you got a bike for Christmas, but just haven’t had the chance to ride it properly yet? While there is no doubt that riding balance bikes is great fun, a fantastic family activity and also has plenty of health benefits – it is also important to stay safe and make sure that you are well protected from falls and other hazards. Probably the most important safety aspect when it comes to riding balance bikes is to find a safe place to ride. Although city streets and life in general is very busy, try to find a quiet and protected area to practise riding – especially if the child is still getting to grips with the principles of balance and steering. It is best to practice on a flat and smooth surface so a playground or somewhere like tennis courts are ideal. This will allow you to help the child improve their riding without having to worry about traffic hazards. If you have to practice on the street or pavement, then a residential cul-de-sac or quiet street make the best options. A couple of falls are almost inevitable when learning to ride a balance bike, and even more experienced riders can take a tumble from time to time. There is a lot of protective gear available for children, and the most essential piece of kit is a balance bike helmet. 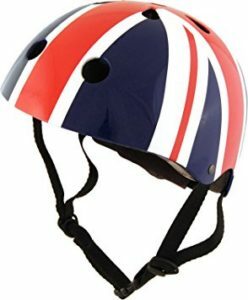 We have already looked at options from manufacturers such as Kiddimoto who provide bright and cheerful designs, (including the Union Jack helmt) although there are plenty of other options available as well which even include a Peppa Pig helmet! Balance bike riders can also wear kids bike gloves, which help the rider to look cool as well as providing extra grip and protection from falls. Kids bike gloves are also available from Kiddimoto, as well as from more specialist providers such as Polaris. Children’s knee and elbow pads are also available to complete the protective gear, and these are strongly recommended as knees are always likely to get cut, bruised and grazed in the event of a fall. It should also go without saying that balance bike riders should always be supervised, especially younger riders who are possibly more likely to fall. When your child gets more proficient at riding, it can be tempting to let them ride off into the distance but just make sure they don’t go too far! Safety should always be paramount when enjoying balance bikes, and with the right protective gear you can help your child to concentrate on their riding skills. This means you should enjoy some even longer riders and hopefully encourage a love of cycling into later childhood! I’m a mom located in Canada with a kindergarten age girl and I was very excited to learn about balance bikes when she was about 3 years old courtesy of friends. This summer my daughter graduated from the balance bike to a regular pedal bike and I was thrilled at how easy the transition was for her. Having a busy life with work, school and family can be tough to make time, outdoors, celebrating an active lifestyle. Having the balance bike made a huge difference! My friends and I are converts to the balance bike and started a website called kidstoyadvice.com. We are new to posting and managing a website and have taken our inspiration to get the message out about how amazing balance bikes are for learning to ride from several sites – one of which is yours. We recently did a posting about what we think are the top 9 websites for balance bikes – yours is one of them. You can see the article at http://kidstoyadvice.com/9-best-websites-comparing-balance-bikes/. Thank you for being an inspiration! Keep up the great work.